It is not often that we find ourselves dealing with a chipped tooth or a broken tooth fragment. This is because the outermost covering of the tooth- the enamel is the strongest substance in the body, and thus is not likely to chip off. But biting something hard, chewing onto objects or experiencing a blow to the face may cause a part of the tooth to chip off. The moment you have a chipped tooth, a lot of questions come up in your mind such as – how to fix a chipped tooth? Can a chipped tooth be fixed? Whether it is an accident or excessive force that has caused your tooth to break, there are ways to manage it. Some popular ways of dealing with chipped tooth are veneers, crowns, and composite bonding. Moving ahead, we will address the several different ways in which a chipped tooth can be managed. Why do teeth chip off or break? A fall, blow or any other traumatic injury. One may think that a chipped tooth requires no treatment if it is not bothering you or giving you any pain. However, it is essential to visit a dentist even though it is not harming you since it can cause pain and infection later. It also risks exposure of the softer, underlying dentin which may be exposed to decay. If the tooth is chipped such that any sharp surfaces are left, these may cause injuries to the soft tissues in the mouth. Also, a chipped tooth is not aesthetically pleasing. We must know the difference between the three terms mentioned above. Superficially, they all imply some breakage in the tooth structure, but the degree of the breakage ranges from a minor crack in a chipped tooth to a complete fracture in a broken tooth, dividing the tooth into parts that cannot be fixed. The treatment process also varies depending on the severity of the crack or breakage. After having a part of your tooth chipped off, if you cannot see a dentist right away, there are some important things to be kept in mind to prevent any further damage to the tooth or reduce the risk of infection. Take a painkiller to reduce the pain, if any. To prevent the occurrence of a swelling, ice can be applied externally. In case you find it uncomfortable or painful to brush in that region, the area can be kept clean and free of any debris or food by usage of mouthwash or rinse. It is recommended not to eat anything hard, hot or sticky and opt for soft food to avoid any pressure or undue force to the chipped area. If there is a fragment of the chipped off portion, it should be kept in milk, or one’s saliva- free of any contamination until the dentist can have a look at it. Depending on the amount of tooth structure that has chipped off, the location of the tooth, the needs of the patient and the condition of the remaining tooth, multiple treatment options can be explored. This is the simplest way to fix a small chip in a tooth, and also most preferred due to its aesthetic superiority. 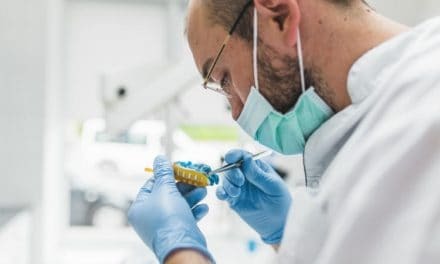 When only a very tiny portion of the tooth has chipped off, the dentist can mold a material called composite resin onto the existing tooth and shape it to replace the chipped off part. Light is usually applied for a few seconds to micromechanically bind this composite to the tooth. Bonding is a relatively simple procedure and involves cleaning, wetting, and etching of the tooth with an acid, to prepare it to receive the composite resin. When done meticulously, it looks just like the natural tooth, and it is almost impossible to make out where the chipping took place. To replace the broken part of a tooth, a thin porcelain shell can be placed on it to cover it. This porcelain sheet is known as a veneer. A veneer is used instead of a composite when the defect to be covered is slightly larger. Veneers cover only the front portion of the tooth, similar to artificial nails placed on our natural nails. To place a veneer, the tooth has to be prepared- it has to be slightly reduced in size and made smooth to receive the veneer. Similar to bonding, the veneers are then fixed using a light. Crowns can be called an extension of veneers, in the sense that unlike veneers, they cover the entire tooth. Crowns are placed when the crack is much larger and on multiple surfaces of the tooth. For placing a crown too, the tooth has to be prepared, and it is then cemented onto the natural tooth. Crowns can be made of metal, porcelain, raisin, or porcelain fused to metal. These are usually indicated when a significant portion of the crown is damaged, and the root is intact. If the problem in the tooth is more severe than just chipping off, if there is a visible crack or breaking off of a larger fragment, a more elaborate treatment is required to manage it. If the tooth structure has broken off and there is underlying decay which may have spread to the deeper parts of the tooth, the entire root should be disinfected, cleaned and filled with a restorative material through a root canal treatment. At the end of a root canal, depending on the amount of tooth structure lost, a final restoration has to be given in the form of a crown or a composite filling. If there is excessive breakage of the tooth, in a manner that it cannot be put back into place, and there are multiple breaking points or fragments, the tooth may be impossible to salvage. In such a case, extraction is the only option. The tooth can then be replaced by an artificial tooth in the form of a dental implant or bridge. To summarise, a chipped tooth is a problem that doesn’t look good, or feel good even though it may seem like a small issue. It is essential to visit the dentist on time and have it examined for any underlying damage so that the appropriate care can be rendered. PreviousWhat is Jaw Bone Tumor? How do You Identify Jaw Bone Tumor? NextAre teeth bones? What are Teeth Made of? Tooth Extraction During Pregnancy – Is this Safe?